Appointment Policies Realizing that nearly all of our clients have delicate health situations with very limited appointment flexibility, we strive to have a fair and balanced policy regarding changes that may occur. We hope that you understand that while we are truly sympathetic, our instructors cannot absorb the full financial responsibility of last minute changes and cancellations as we reserve specific times for each client and can only work with a few clients each day. We appreciate your help and understanding. Scheduling Appointments for classes are typically scheduled and prepaid a month or more in advance. Monthly participants have priority enrollment each month. To skip a month or discontinue please give 30 days notice when possible. To reschedule appointments, we require at least 24 hours notice. For private and semi-private sessions, if you decline or miss your appointment for any reason without 24 hours notice, we will give you a partial credit of $25 on your next invoice. (Please note that missed group classes do not receive credits. ) If you agree to a rescheduled date for a class and can’t attend, no credit or make-up is given. Appointment times are reserved for each client. Please try to arrive early to take full advantage of your allotted time. Enrollment in Small Group Classes We want everyone to be successful and have the support that they need. Due to the nature of a group class, participants need to be able to follow simple step-by-step directions and be able to use a paint brush independently. If considerable assistance is needed, a private session or a “Painting for Two” class may be recommended instead. In the event your instructor is unable to provide a class for which you have paid, we will give you a credit, reschedule or arrange for another qualified instructor to help during the absence. Prepaid Unused sessions All scheduled prepaid sessions are non-refundable. If you are unable to use your prepaid session(s) , you may elect to receive gift certificates that you can give to someone else, or donate the session(s) to our benevolent/scholarship fund. Regarding Corporate Sponsored Programs Please refer to our Service Agreement for details. Click the image to see a gallery of Ken's inspiring images. 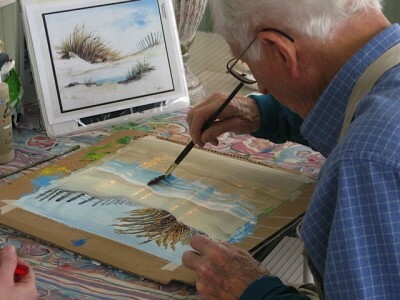 He started painting at the age of 95.